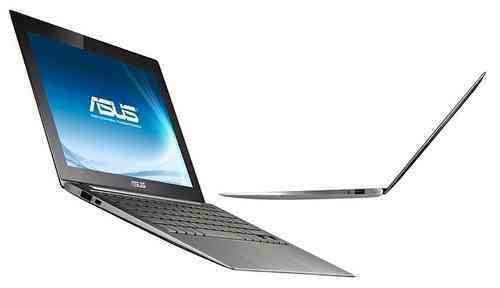 Asus Philippines has announced the official pricing for the 11.6-inch Asus Zenbook UX21 ultrabook. Only one configuration for the Asus UX21 will be offered in the Philippines. The UX21 is priced at Php53,995. Specifications as compared to the 11-inch MacBook Air. Compared to the 11.6-inch MacBook Air, the Asus UX21 is a tad bit thinner and lighter, but essentially has the same specifications as a the 11.6-inch MacBook Air with 128GB of storage. Since the internals of both machines are made by Intel, it is really no surprise that they carry nearly the same hardware. The main differences are that with the UX21 you get a mini-HDMI port instead of a Mini Display Port on the MacBook Air, USB 3.0 instead of Thunderbolt and Windows instead of Mac OSX. I would say the UX21 is the more relevant machine to most users as HDMI and USB 3.0 are more useful than a MDP and Thunderbolt. The operating system is a matter of personal preference. The UX21 also does not have a back lit keyboard, but does give you nice aluminum keys which should hold up better to wear and tear than Apple's keyboards. You can get keyboard protector for your Mac, but you would be compromising ventilation. The UX21 also sports better speakers and audio. Price. At Php53,995 is Php5,995 cheaper than the similarly equipped 11.6-inch MacBook Air. The UX21 also comes with a free sleeve, maybe another Php800 in value. The entry level 11.6-inch MacBook Air is actually price cheaper, but it comes with a smaller 64GD SSD drive for storage and 2GB of RAM. All in all, the UX21 is a better bang for the buck option than the 11.6-inch MacBook Air offerings, with one caveat, the track pad issue below. Still the UX21 is not cheap, and I do not see it being a big seller in the Philippines. Others. Every review of the Asus UX21, reports a glitch with the track pad which leaves it overly sensitive. Before buying one, make sure this glitch has been resolved. Photo Graphic Design Software for Mac Graphic Design Software on Mac OS X like Corel Painter, Illustrator CS6, MyBrushes are those Best Graphic Design Software for Mac OS X.